I'm a big advocate for early reading. My mom taught my sister and I to read before entering kindergarten, and it didn't hinder us at all. We might have been a little bored while Johnny was learning to read "See Spot Run," and we were onto The Boxcar Children, but beyond that, we were perfectly normal, if not gifted and talented. 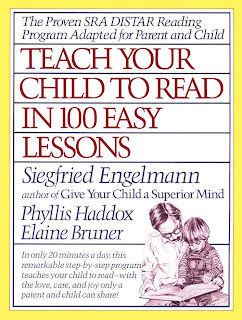 I recommend Teach Your Child to Read in 100 Easy Lessons, by Engelmann, which is a scripted book that will have your child reading at a second grade level in 100 lessons! That is just incredible! 100 lessons/days later, and your child will be able to read and decode phonetically what alot of children can't do in the fourth grade! Remember, the small motor skills that are necessary for writing usually develop much later than their necessary skills for learning to read. Please do not hold your child back from learning to read because they can not hold a pencil or cut straight. That will come with time. On the other hand, once you have started your child on reading, don't forget to work with your child on their small motor skills. Coloring, cutting, lacing beads on a string, placing small objects (beans, rice,) into a cup or bowl with a spoon, will help these skills develop naturally. Or, if you are like me, check out some great new materials, by Mead, which includes "Color Bound," a coloring book with raised lines so that your child knows when to "stay between the lines." (so cool!) They also have a litany of products for Early Writing skills! There are other great reading systems out there, but remember to look for one that teaches your child phonics, and not just sight words. You child should be able to recognize a list of Sight words (google Dolche or Frye list,) but this comes secondary to learning how to decode. Also, remember those leveled readers? Stock up on them! They are awesome for this reading stage because the learning child will feel like they have conquered a mountain, and most of these books introduce new vocabulary throughout. Better than a long story book that feels like you will never complete it! My mom always read to me as a child. I looked forward to it all evening. She has even bought books to read to my children one day. Please not I am not even married yet, not till November anyway. In the meantime she continues to build her "grandma library." That book looks good! And I like your thought on not having to teach them to write at the same time that they learn to read. Rod and Staff had some good level readers, if I remember correctly. I remember liking them because they mostly contained Bible stories, and any extra biblical training we can throw in with everything else is always good, right? I remember in fifth grade or somewhere around there I was bored and picked up my younger sibling's Rod and Staff reader, and I was amazed, because it had a bunch of Bible stories I hadn't even heard of before! Like about Absalom and David's other sons. And I had grown up in a Christian home, so I got alot of the Bible; I was pretty excited to read a story I hadn't heard before. I read straight through that thing! It actually encouraged me to start reading through the entire Bible myself, which I started doing in the same grade.